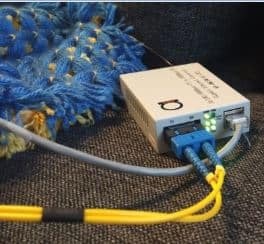 With many variables in play, it can be very trick to know what to do, and what not to do when you work with network cables and design. To work through all the possible permutations, it would help if we could find a way to only change one variable at a time. This can easily be achieved if we use the IEEE network speciﬁcations that are implemented through ANSI/TIA-568-C. The specifications define a maximum horizontal run length of 100 meters (308′). This includes communication closet patch cords and workstation. This ﬁgure has been determined as a result of timing limitations experienced in some Ethernet implementations. So the maximum distance is ﬁxed. Now that two of the three variables have been defined, we can focus on the last one. Cable design aims at improving the signal level while reducing the noise in the cable at the same time. By doing this, we can achieve optimum transmission performance for specific frequencies at a ﬁxed length. From the statement above you may reason that this implies that you could have horizontal run lengths greater than 100 meters. To achieve this, you would have to lower your bandwidth expectations, or accept a lower signal level. Although the standard specifies a maximum distance of 100 meters, you could technically increase this length. If you ignore length and instead link frequency and SNR, you could plot the frequency at which the signal and noise level coincide against distance. From this, it is clear that at a signal frequency of 10MHz, a Category 5e cable can of carry a signal almost 2,500 feet, which is well beyond the 100 meter (308’) length speciﬁed. There are however good reasons for not doing this. You would be undermining the principles of structured wiring, which requires parameters that will work with various LAN technologies and not only the one that you might be working with today. Some network architectures will not allow longer lengths and with good reason – if you use longer lengths, future upgrades might not be possible. Whatever you do, stay with the 100 meter maximum length speciﬁed. Otherwise, use Fiber, and Fiber Media Converters to extend the distance, or our LAN extender range for copper pairs. The data rate (information capacity or throughput) is deﬁned as the number of bits that move through transmission media per second. With older LAN technologies, the data rate has a one-to-one ratio to the transmission frequency. 4Mbps Token Ring will for example operate at 4MHz. It is difficult to keep pushing copper cables’ bandwidth higher. They are after all bound by the laws of physics. Techniques have therefore been developed to allow more than 1 bit per hertz to move through the cable.